FANBOY PLANET.com . : Blue and Gold Movie :. 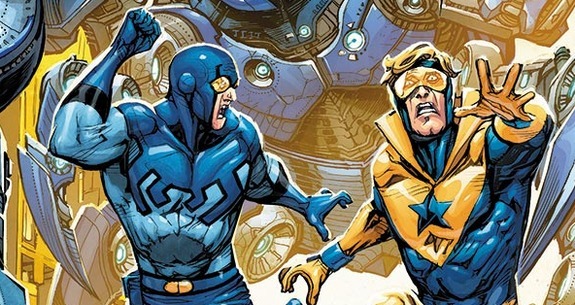 Okay, that's not really how they said it, but it's clear: Warner Brothers plans to develop a Blue Beetle/Booster Gold movie, described as a superhero buddy cop movie with an emphasis on comedy. Which it should be. Not only that, but the studio wants Arrow/The Flash/Supergirl executive producer Gregg Berlanti to direct and executive produce the film, with the possibility of Zak Penn writing the script. A lot could happen between now and ...whenever they want this film to go into production, but not only does the approach run counter to everything else we have been seeing about the DC Cinematic Universe, it's the first time that fans could unequivocally say "yes! That's what we want!" ...if they know who Blue Beetle and Booster Gold are. Originally solo characters, they teamed in Keith Giffen and J.M. De Matteis' Justice League International comic in the 80s. 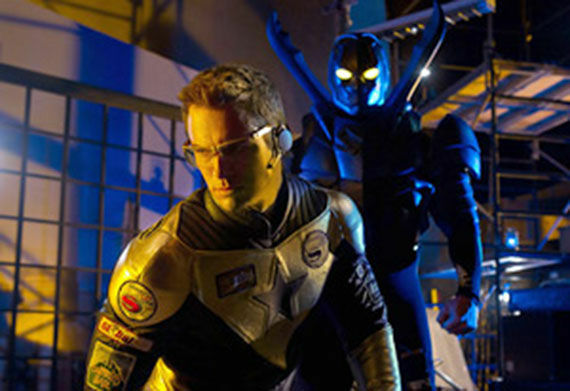 Blue Beetle was millionaire industrialist Ted Kord, and Booster Gold was 25th Century disgraced football player Michael Carter, who stole technology and traveled back in time. Didn't Pat Morita and Jay Leno do this one? It's obviously way too soon for casting, but let the speculation begin!